Writing is considered one of the most difficult literacy tasks. Many students with learning disabilities struggle with the process of writing as well as the mechanical componets of the writing task. Technology can provide support to the mechanical demands of the writing process and is often a welcome tool to students. When asked about AT supports for writing there are many, however some of the standard AT tools of mechanical writing are voice recognition, use of text to speech, word prediction and adaptive or customized writing environments. Although there are others (especially those with text to speech) here are some apps that show good reviews and provide basic features of the standard AT tools for writing. At the present, phonetic word prediction does not appear to be present in writing apps (may be found in more advanced text-based AAC apps such as Predictably). Note taking, story telling, graphic organizing or concept mapping apps are anticipated to be reviewed in upcoming posts. 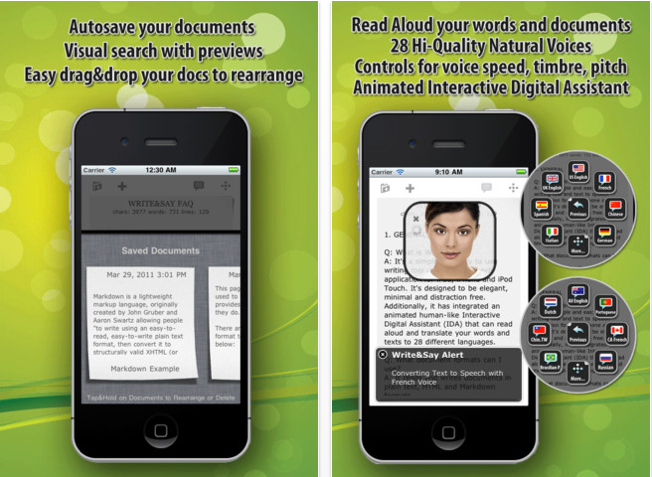 Dragon Dictation – Created by Nuance, the makers of Dragon NaturallySpeaking, provides this free voice recognition app for iPod/iPhone/iPad. It requires Wi-Fi service for the translation of your voiced file to text. Dragon Dictation is amazingly accurate given the fact that no training is required prior to its use. It uses some of the standard Dragon NaturallySpeaking voice commands for formating and document navigation. Check out the voice command listing in the previous post, Dragon Dictation to help with voice navigation and punctuation commands when composing. Options for publishing the text include copying, emailing, cutting or sending it to Facebook or Twitter. Dragon Dictation minimizes the demands of the mechanical writing demands. I requires a significant cognitive component to organization thoughts, speak out punctuation and recall commands for document navigation, editing or formating by voice. Dragon Dictation however is a boon for those who have significant spelling challenges, difficulty getting their ideas down on paper and rely on scribing to others. Good articulation, Wi-Fi service, and the ability to read your translated text is required to use Dragon Dictation app. PaperPort App – This is Nuances new free digital note taking for your iPad that captures hand written notes, typed text, images, web content and audio. PaperPort Notes even allows you to take advantage of the Dragon Dictates voice recognition software produce your ideas and notes simply by speaking. 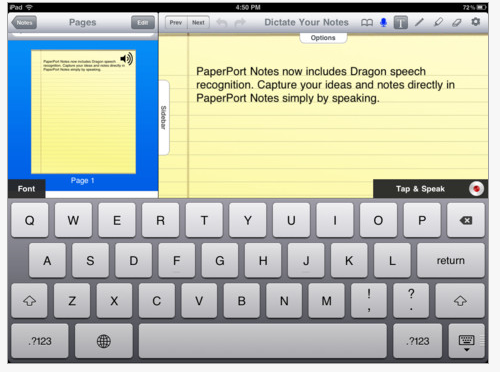 This is a fabulous app previously reviewed in a previous post PaperPort App – Dragon Dictation on Steroids. 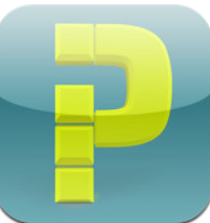 PaperPort app provides a “scribe-like” tool with additional support of importing pictures into the app. Tools to draw and type are available along with the capabilities of “speak text” tool to be used to list to the transcribed text. Best of both worlds, this app provides voice recognition in a note taking app with many tools including “speak text” capabilities. Good articulation, written organization, knowledge of conventions for punctuation and capitalization and editing is required to support the writing process. Ability to manually navigate in the app is required to access tools and menus. Great tool for students with learning disabilities to get their thoughts down on paper and review the text using “speak text” tool offered in iOS5. Write & Say App – This app provides a word processing environment with text to speech, translation and the ability to convert your text to MP3 format. Many languages and voices are available within the app. Boost high quality voices for its text to speech tool. Compatible with iPhone/iPod and iPad, (9.99). Provides the ability to email your documents. 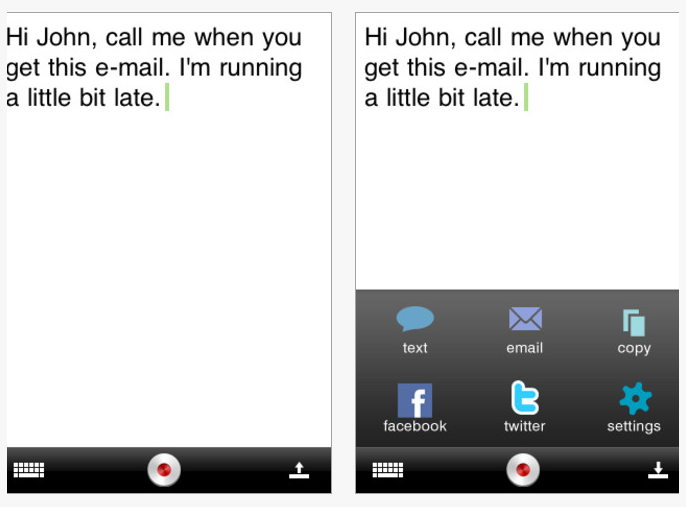 Typ-O – A simple word processing note pad with word prediction and text to speech provided to read your text aloud. Provides the ability to email your work or copy to the clipboard to transfer to another word processing or note taking app. Basic setting options of reading sped, pitch and word prediction vocabulary and spelling skill options are provided to support the writer’s skill level. 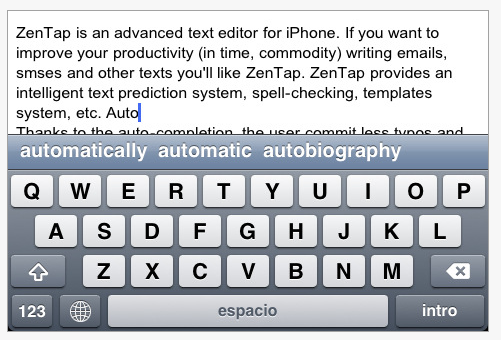 ZenTap – A word processing app featuring advanced word prediction. Compatible with iPhone/iPod and iPad provides a free and Pro version (2.99), ZenTap provides a word processing environment with word presented above the keyboard for easy presentation and access. Words are predicted using an alphabetic formula, rather than a phonetic or grammatic method of generation. Spell checking is also provided in the app as well as the ability to translate to other languages. No text to speech is provided in the app, however if voice over capabilities are enabled, cursory text to speech will be available. Word processed text can be saved, emailed or copied for use in other apps. For its cost, ZenTap provides many features along with its word prediction tool. 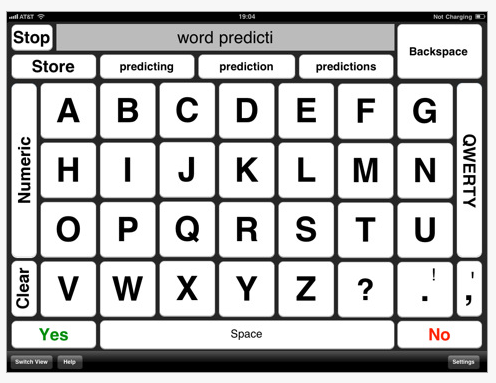 Intellipad App – This word prediction and customizable keyboard app provides many options for students with special needs. Compatible only with iPad (19.99). Intellipad provides a word processing environment with word prediction presented above the keyboard for easy viewing and selection. Word prediction is generated alphabetically as you type. Text to speech is also provided for easy auditory review of the text. This is a great app for elementary aged students with learning disabilities who have difficulty generating written work. Working with the app to become familiar with it I easily customized a math keyboard with math symbols as a solutions for students having difficulty handwriting simple math problems. 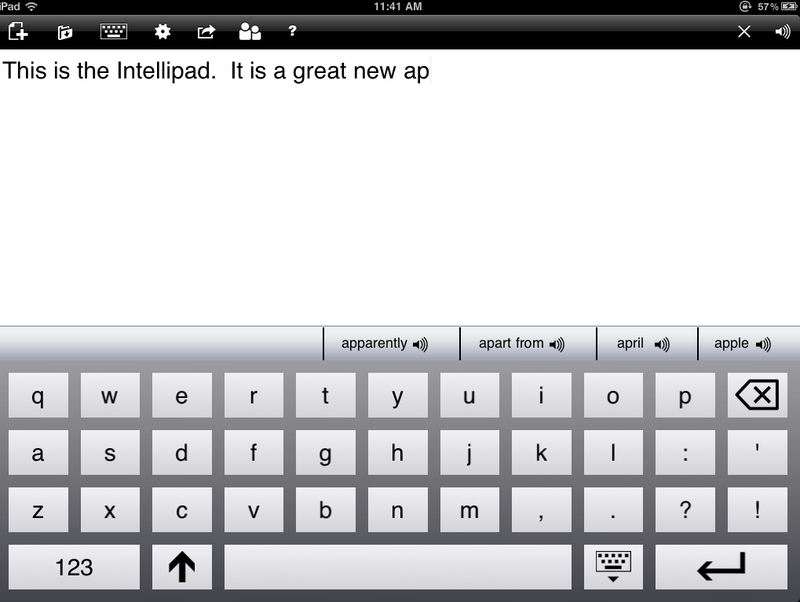 Another outstanding feature of Intellipad is the ability to modify the keyboard and key contents. 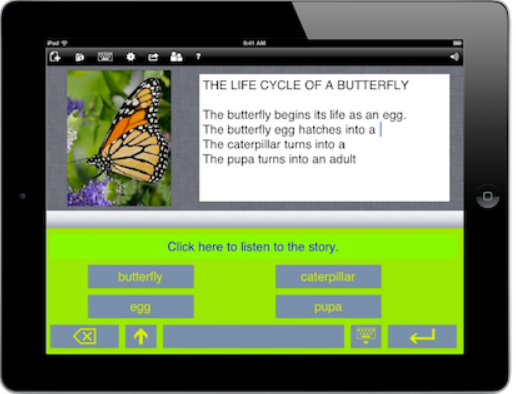 Intellipad is a great app providing access and scaffolding of writing supports for special needs students. For more information visit an earlier post dated October, 2011 on Intellipad. 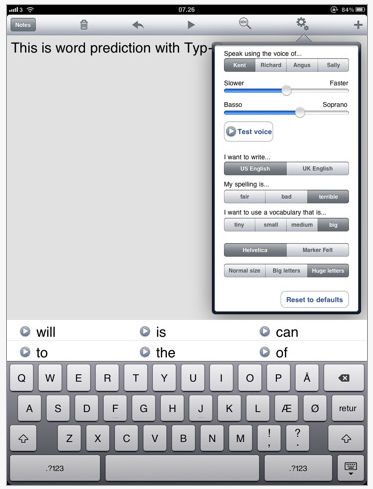 iMean – Another app providing word suggestions with an alternative keyboards available with text to speech capabilities. Compatible with the iPad (4.99), this app provides options of an ABC, QWERTY and number keyboards with word suggestions and text to speech available when the word enter the typing window. Easy switching from keyboard to keyboard is available directly on the keyboard. Capabilities to change from keyboard to word processing view as shown above is readily available. Copying capability allows for transferring the written information to a word processing or note taking app. There are many more mechanical writing apps for students with learning disabilities, however those reviewed provide possibilities for elementary through post secondary aged students with challenges with spelling, writing/typing. Hopefully in the near future phonetic based word prediction with be provided within apps for those students or individuals who have not yet acquired transitional or conventional spelling skills. Have any mechanical writing apps to share ? Please post a comment with any apps you might suggest. What’s in your OT iTool Kit for writing? This entry was posted in App Reviews, Apps for OT's, Apps for Special Needs, High School, iPad, iPhone, iPod, Language Arts, Learning Disability, Middle School, Occupational Therapy, Post secondary, Special education, Special Needs, Text to Speech, Writing and tagged App Review, iPad, iPhone, iPod, Learning Disability, occupational therapy, OT Apps, special education, special needs students, Writing. Bookmark the permalink. Jackie, Good question. I was so excited to find Intellipad because there was just nothing like it available. I haven’t found another keyboard as of yet available like Intellipad or now Abilipad, but I can tell you that Intellipad has changed names to Abilipad and for this weekend is 50% off. It that is affordable this is the only app with modifying capabilities that I am aware of. Hopefully the 50% price is affordable. Thank you for this great list! I was wondering. Are there any apps to help parents keep a food log? And, are there any apps to help kids who come to OT for sensory eating issues? Sorry, one last question. For students whose voice is not picked up accurately by Dragon Dictation, can you recommend a different speech to text app? Thank you so much. Right now I do not know of any apps to help with kids with eating issues. Using the iPad/iPod as a motivator or a reward system app might help with enlisting kids participation. It is a huge motivator the the school I work at for students. In regards to students voice that is not picked up by Dragon Dictation, it is my pick, have you tried using a microphone with the app? That is often recommended. If you have the headphones with the mic in it, attach that for improved recognition or even a high quality, compatible microphone made to work with the iPad (some microphones jacks require more power and won’t work. We have used the mic for just recordings and that has made a difference in the quality, which should help with recognition. I also make sure that the iPad is positioned upright and students are speaking clearly right into the mic at the top. I have not trialed any other than Dragon Dictation so give a holar if you find another one that works well! Good luck- let us all know what you found and worked out! This is tremendously helpful. My wonderful 6 year old son is on the Autism spectrum and has significant fine motor issues driving us to find an ipad app that can help us learn how to type. One that is geared to a young child which could possibly make a game of the typing process. We have an external keyboard for the ipad. Do any of the apps mentioned above perhaps work or otherwise? Thank you! I apolegize for the delay in replying to your comment. 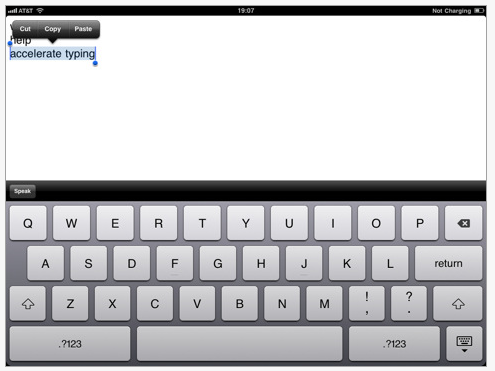 I have recently posted two different reviews on apps or website for typing practice on the iPad. Here are links to the posts on my blog if you are still in need or interested. Sometimes it takes me a while to find some answers! This is a great article! I just evaluated a 13 year old boy with poor fine motor skills. He is able to copy sentences legibly, but is not able to express his thoughts due to poor fine motor and severe spelling issues. I would love to try all of the above recommendations, but I simply can’t afford it. Which program do you think is most user friendly for a cognitively delayed child and most reasonably priced? A response was sent directly to you with some additional questions. I hope you received it! If not please contact me again. Thank you for visiting and your comment! Carol…i wrote you back right away. Did you not get it?? Just did Kimberly, hope you received my reply. Thank you for visiting and your comments/questions. Best of luck! Hi Carol! I would love to see your response to Kim. Her post hits very close to home. Is your response to Kim something you could post or send to me? Hi Angie, I sent a response via email to you at comcast.net . a number of these apps are not available in the US iTunes or App Store. Barnegat Blummis, thank you for your comment. Time to update those lists!